On 21 June 2016, UNESCO hosted a path-breaking Consultative Meeting on the contribution of the UN system to the promotion of peace. The meeting was attended by heads of 28 United Nations entities (programmes, funds, specialized agencies and bodies), who discussed the advancement of the global peace agenda and took stock of the present situation – and the future of the agenda in the new millennium. PRIO Visiting Fellow Priyankar Upadhyaya (UNESCO Chair for Peace and Professor of Peace Research at Banaras Hindu University) is a member of the Steering Committee of this ambitious project, and is likely to lead the preparation of the resulting compendium. In the Geneva consultative meeting, Professor Upadhyaya delivered the keynote address: ‘Peace is a Process’. 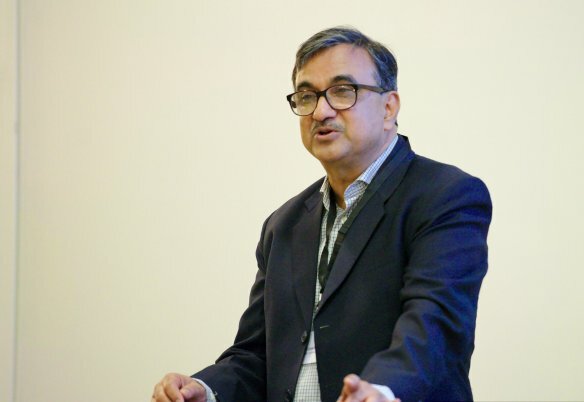 In his a thought-provoking presentation, Professor Upadhyaya provided a holistic and dynamic approach to the concept of ‘peace’ as a continually evolving process with immense transformative potential to synergize human community, ecology, and planetary concerns in a mutually enriching manner. Sustainable peace is thus about the interweaving of relationships between individuals, groups and institutions that value diversity and foster full development of the human potential. A composite focus on ecological integrity and socio-economic justice must inform the twin quest for peace and sustainability. UNESCO’s rights-based approach to education, incorporating equity and inclusion, is the key to counter discrimination that leads to fractures and tension in society. The Consultation was a part of the on-going UNESCO project on Progress and Challenges for the Peace Agenda of United Nations Entities. The project is led by UNESCO under the International Decade for the Rapprochement of Cultures (2013-2022). Yes indeed, peace is a process. In traditional security approach, peace has seen as an end or ultimate end, but the structural causes that cannot be remove for always, the process of peace will be continue. Thanks for the responses. Wishing that peace would attract as much attention and debate as conflict. Exactly! Peace is development of human, society and universe. Development is also process which is part of individual life . this process always success but time taking because we understand all these things.